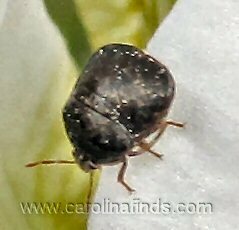 Kudzu bugs, megacopta cribraria, are a relatively new pest to the United States. As their name hints, they like to eat kudzu. The problem is, they also love soybeans and other legumes. A relative of the well-known stink bug, these insects also smell bad when mashed. Hopefully these imported pests will be gotten under control and now take over as fire ants have done.